If you’re wondering how to improve your IELTS Reading score, then you’re in the right place! In this post, we’ll take a look at how to get a good score in IELTS Reading (or how to give your existing band scores a boost). As you work on your IELTS Reading section, keep in mind that moving up a full band score may require significant improvements to your English skills. If you feel you understand the test well and your strategies are sound, it may be that you have to put in the time and effort to improve your English, rather than working primarily on test-taking strategies. Improving your band scores for each section of the IELTS is the only way to boost your overall IELTS score, which is an average of your four sectional scores, so you’re off to a good start by working on your reading. Luckily, we can learn a lot from the IELTS reading rubric and IELTS reading band descriptors provided by the IELTS test makers. IELTS Reading is scored in bands from 1-9, and includes half bands (for example, 4.5 and 5.5). There are 40 questions overall on IELTS Reading, meaning that if you want to move up to the next full band, this means that you’ll have to answer up to 6 more questions correctly. This can seem daunting, particularly if you have just taken the test and expected to score in a higher band. However, a lot happens during the IELTS exam, and understanding how you performed can help you reach a higher band the next time. What does this look like? Here’s an overview of the IELTS band scores, straight from the official test-maker. Band 5 Modest user You have a partial command of the language, and cope with overall meaning in most situations, although you are likely to make many mistakes. You should be able to handle basic communications in your own field. Consider what happened during the exam that may have had nothing to do with your preparation, English skills, or approach. Is there something you can improve upon among these factors that could give you a boost next time? Did you just have a bad day? Was your stress level too high? Was there a particular reading passage that caused you significant problems? Once you know what caused your lower-than-desired IELTS band score, you can start to find strategies to raise it. After analyzing your performance on test day, it’s time to get started and find the best ways to raise your score! Was timing an issue for you during IELTS Reading? Not having enough time to read and answer questions is the #1 problem students report to me about the Reading paper. And actually, traditional reading patterns don’t work very well on the IELTS. Reading the passage from beginning to end before answering questions does not work for most people. One would have to be a very fast reader to approach the test this way and get a high band score! So what can you do to get faster? Learning strategies that are specific to IELTS Reading is key. It is essential to master these skills through repeated practice. Importantly, it’s essential to master skimming and scanning. When you skim, you strategically read different parts of the text to get the gist of the passage. Scanning, on the other hand, involves strategically looking for key words. The following method helps many students succeed, but takes some time to master! 1. Spend about 3-4 minutes carefully skimming the text. Try to label each paragraph (2-3 words only), identifying the main topic it contains. This helps you to locate that paragraph quickly when you answer questions. It is also a good mental exercise because finding enough information to apply a basic label to a paragraph shows that you are skimming purposefully and effectively. 2. After scanning, answer questions by scanning. This is challenging. It can be very time consuming to scan for answers in a text of more than 800 words (that you haven’t read carefully). Veteran IELTS test-takers may have noticed that IELTS Reading rewards a large vocabulary. You can benefit from this knowledge by learning 10-15 new words every day and keeping a vocabulary journal. 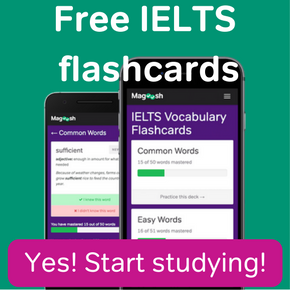 In fact, Magoosh can help you with mastering these words; check out our IELTS vocabulary flashcards! IELTS Reading questions also become a lot easier once you are familiar with the question types that appear most often on the exam. How can you do this? 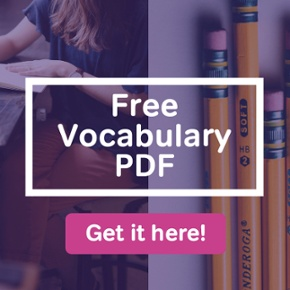 First of all, become familiar with each question type with Magoosh; we have detailed lessons that cover strategies for each question type, and guided sample questions (within the lessons) that show how to apply the strategies discussed. 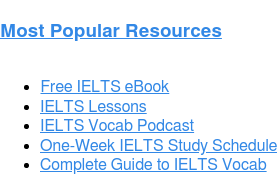 You can also check out our post, the Complete Guide to IELTS Reading, where at the bottom of the page you’ll find an overview of each question type. 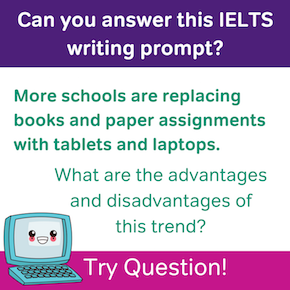 Finally, if the test format itself is not the challenge, improving your English skills by building reading into your daily schedule is a fantastic way to boost your IELTS Reading band score over time. While moving up one or more IELTS Reading bands doesn’t often happen overnight, it is absolutely possible! It will take time and commitment; it will also take a series of great resources (such as you’ll find at Magoosh!). But at the end of the day, don’t get discouraged! As the saying goes, slow and steady wins the race. For a quick review, bookmark this page and scroll down to these tips to remind you of exactly how to keep your practice at its most effective! Study online with Magoosh online prep! 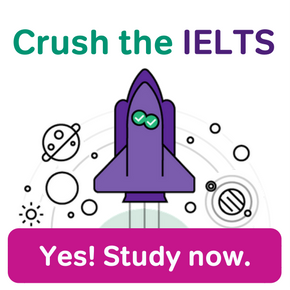 Now that you know how to get a good score in IELTS Reading, perhaps you’re interested in how to improve your score for the other sections of the IELTS. See our accompanying posts on the band descriptors for Listening, Speaking, and Writing.